This article is about the Mercedes-Benz commercial vehicle. For the Toyota compact sedan, see Toyota Sprinter. The Mercedes-Benz Sprinter is a light commercial vehicle (van) built by Daimler AG of Stuttgart, Germany as a van, chassis cab, minibus, and pickup truck. In the past the Sprinter has been sold under the Mercedes-Benz, Dodge, Freightliner, and Volkswagen nameplates. 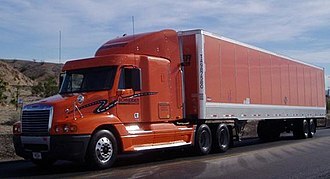 In the U.S. it is built from complete knock down (CKD) kits by Freightliner. They are now primarily marketed by Mercedes-Benz. Rebadged and re-engined Sprinters were also sold by Volkswagen Commercial Vehicles as the Volkswagen LT and the Volkswagen Crafter. The first generation Sprinter was launched in Europe in 1995 to replace the famous but outdated Mercedes-Benz TN van dating from 1977. It was voted International Van of the Year for 1995. The first generation (VA Chassis) North American Sprinter was launched in 2001 in the U.S. and was originally branded as a Freightliner. Units sold to the rest of North America were badged as Mercedes-Benz until 2003 when they received Dodge branding. Units in the United States and Canada, but not in Mexico, could be purchased as a Dodge or Freightliner from 2003. The product was launched and supported by DaimlerChrysler Vans LLC, a small division based in Huntersville, North Carolina. Key individuals from DaimlerChrysler Commercial Vehicle Division and Freightliner Trucks were selected to spearhead the effort and made up the bulk of the division. 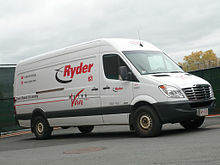 DaimlerChrysler Vans LLC retained sole responsibility for the North American Sprinter market until the sales, service and parts support responsibilities were absorbed by Chrysler Commercial Vehicle Division in 2004. Nearly all of the original staff were retained, though the base of operations shifted from North Carolina to Auburn Hills, Michigan. The remainder of DaimlerChrysler Vans LLC remained active in Huntersville as an engineering, upfitter certification and safety compliance resource in support of the Sprinter. For 2003, DaimlerChrysler introduced a Dodge branded version of the Sprinter to the North American market. It was identical to the Freightliner Trucks version except for minor styling details and badging. Rather than redesign the aging Dodge Ram Van which had used the same basic body and layout since the 1970s and was discontinued in 2003, DaimlerChrysler chose to replace it with the Sprinter. From 2001 until 2006, cargo van versions of the Sprinter were manufactured in Düsseldorf, Germany, partially disassembled and shipped to a facility in Gaffney, South Carolina where they were reassembled. The cargo versions, classified as light trucks, are subject to the 25% chicken tax if imported as a complete unit, which is avoided by the disassembly and subsequent reassembly. Passenger vans were not subject to the same tax classifications and were imported as an assembled unit through Mercedes-Benz in Jacksonville, Florida. The cargo version of this model is re-assembled at a plant in Ladson, South Carolina which was previously used as an American LaFrance factory. 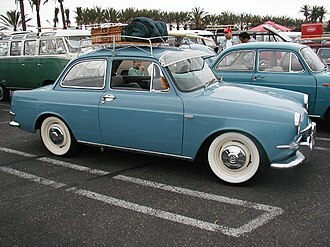 Like its predecessor, the passenger version is imported as a complete unit. The previous reassembly facility in Gaffney, South Carolina continues to be used by Freightliner Custom Chassis Corporation. The Sprinter van was sold as the Mercedes-Benz Transporter T1N due to Toyota using the name Toyota Sprinter, a version of the Corolla. The model 314 of the first generation is still assembled by Iran Khodro Diesel. It is used as an ambulance car. Since 2013 the 2000-2006 Sprinter model has revived in Russia markets only as Mercedes-Benz Sprinter Classic. 2002-2006 grille was used on the Sprinter Classic & also the Sprinter Classic used the 2000-2006 dashboard design but this time Sprinter Classic used the steering wheel from the 2006-2014 Sprinter moldels. However the Mk.2 Sprinter is also sold in the Russian market. The Sprinter Classic is built by the Gorky Automobile Plant at Nizhny Novgorod. The second generation Sprinter was introduced in Europe in 2006. It was voted Van of the Year 2007 and again in 2008 by Professional Van and Light Truck Magazine. 2012 Information and Fuel Consumption Figures. Also known as the NCV3 or New Concept Van 3. The NCV3 appeared in Europe and in other countries in the 2006 model year. North America received its own NCV3 for the 2007 model year. The US cargo version of the 906 NCV3 comes in two wheelbases options (144", 170"), two roof heights (standard 60.6", high 72.4"), three lengths (Short 233.3", Standard 274.2, Extended 289.8"), and two weight classes (2500, 3500) where the 3500's have the option of dual rear wheels or rear super singles. Neither the 128in wheelbase nor the rear super single tires are available in the United States market. 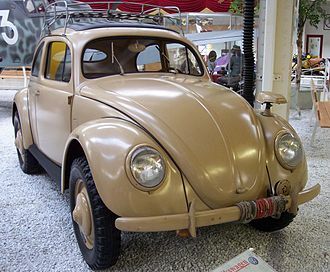 The US cargo version are reassembled from kits in an assembly plant located in Ladson, South Carolina, while the passenger models are imported directly from Germany. The second-generation 906 was produced in Argentina only for export markets—except Mercosur markets (Brazil, Uruguay and Paraguay)—from 2007 until 2010, but in 2011 announced new production of the second generation in the Centro Industrial J. Manuel Fangio, in Buenos Aires with the brand new OM 651 engine (also local made) and exported to the rest of America (including Mercosur markets). Since 2012, it is manufactured for the Mercosur and 40 other countries. A class action lawsuit was filed in California state court against Mercedes-Benz alleging the defendant has sold Mercedes-Benz Sprinter models 2500 and 3500 with water that leaked from the air conditioning unit in the roof onto the passenger area. The leakage of air conditioning unit was also discovered on Dodge Sprinter made by Mercedes-Benz from 2003 through 2009. The lawsuit affected California residents with the rooftop AC units and Sprinters equipped with the rear AC. Changes include the addition of new assistance systems (crosswind stabilization, collision avoidance system (optional), blind spot monitor (optional), adaptive highbeam, lane departure warning system), Euro VI emissions compliance, redesigned radiator grille, more angular headlights, new upholstery and seat coverings, thicker steering wheel, optional fresh air nozzles boast chrome applications, new-generation radio system. The vehicle was unveiled in 2014 International Commercial Vehicles show. Ordering began in June 2013, followed by deliveries in September 2013. Early models include ECO-Gear six-speed manual transmission or the 7G-TRONIC PLUS seven-speed automatic transmission with lock-up clutch. US models went on sale in fall 2013 as 2014 model year vehicles. Early models included a choice of 2 engines (2.1-liter 4-cylinder turbo diesel (163PS) with 7-speed automatic, 3.0-liter V6 turbo diesel (190PS) with 5-speed automatic), 144" & 170" wheelbase (both engines), 3 body lengths, high-roof option, 5 configurations (Cargo, Crew, Passenger, MiniBus, Cab Chassis). Early models include Sprinter 313/513 BlueTec 4x4, Sprinter 316/516 BlueTec 4x4, Sprinter 319/519 BlueTec 4x4; Eco Gear six-speed manual or five-speed automatic (transmission with converter Sprinter 319/519 BlueTec 4x4). US models were set to go on sale in the first quarter of 2015 as 2015 model year vehicles. Early models included 144" and 170" wheelbases in low and high roof configurations, 5 body styles (Passenger Van, Crew Van (mixed 2-row passenger and cargo application), and Cargo Van (both 8,550 and 11,030 GVWRs)), 1 engine choice (3.0 L V6 BlueTEC (exclusive 4x4 powertrain)). From 2014 Algeria started manufacturing the latest model of sprinter Sprinter 319/519 4x2 and 4x4 for civilian and military use. For the 2014 model year the Sprinter receives a more stylish and upright grille with Mercedes' signature 3 slat design. In an effort to make the Sprinter's fuel economy more competitive, North American models will get the 2.1L OM651 2-Stage turbo diesel engine formerly only available overseas, while the 3.0L will be optional. The 2.1L engine (in Europe also the 3.0 L) will be mated to a new 7 speed automatic transmission. A 1.8 L supercharged I-4 gasoline engine mated to 6 and 7 speed automatics will also be added. The 2014 Sprinter will add several new driver assistance technologies including standard Crosswind Assist, optional Blind Spot Assist and Collision Prevention Assist, as well as Lane Keeping Assist and Highbeam Assist. The 2014 Sprinter will now feature LED running lights. Air suspension will be available on the 3500-series model. The 2014 Sprinter also gains a few new options, including navigation, iPod integration, and an air suspension for heavier-duty models. Mercedes-Benz Sprinter was built in Daimler's Mercedes-Benz Düsseldorf and Ludwigsfelde production plants. Between July 2013 and the end of May 2014, Mercedes-Benz Vans sold around 134,000 units of the new model of Mercedes-Benz Sprinter in Europe and North America. Production version of Mercedes-Benz Sprinter-based Volkswagen Crafter by Mercedes-Benz Vans was set to end in 2016. Mercedes-Benz Sprinter vans were used in the Boost by Mercedes-Benz custom transportation program. The third generation Sprinter debuted on 6 February 2018. The Sprinter is designed primarily for business, not private users, although recreational vehicle (RV) conversions are available. In the United States, the first generation Sprinters (2001–2006) were offered solely with the Mercedes-Benz 2.7 litre straight five cylinder turbocharged Diesel. Companies are replacing van conversions with wide bus bodies—Sprinters with side-facing benches and tall right-side doors—as campus shuttles. Limited numbers of complete "wagons" (passenger vans) are being produced in Germany and shipped complete to the United States mostly for personal and church van uses. Typical Sprinter Wagons accommodate 8 to 10 passengers and have glass in all possible factory positions. Vans shipped to the United States on-spec (speculation to sell by dealer/distributor) are mostly sent in Arctic White color, but many colors are available. The Dodge dealer network for Sprinters is limited to certified locations (known as "Business Link" certified dealers, usually only awarded to "Five Star" certified dealers), and dealer knowledge is still limited in both sales and service. Special orders typically take one to three months for delivery, and may take even longer due to the assembly and dis-assembly in Germany, and exporting parts to South Carolina for re-assembly. The exception is passenger van models which are assembled in Germany and exported as complete vehicles. 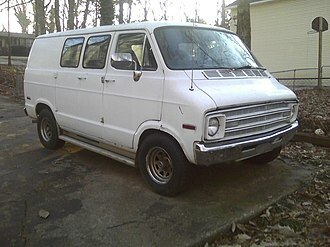 In North America, most Sprinters are sold as cargo vans to expediters in the United States. Such expediters are similar to truck drivers, except they take smaller loads and will wait after unloading until dispatchers find another customer nearby to transport goods. The advent of the Sprinter van with its cargo space of 13-1/2 feet (4.1 m) has allowed van expediters to take three 48 x 48 in (1.22 x 1.22 m) skids or pallets, where previously they were limited to a capacity of two pallets A Sprinter is capable of hauling approximately 3000 lb (1360 kg) of cargo. The vehicle has been adopted by the police in Hong Kong and in Poland, also and as an ambulance by countries in Western Europe, Scandinavia, the US, Australia and New Zealand. The 515 CDI has become the standard ambulance for use by the National Health Service (NHS) in the United Kingdom. Another market in which Sprinters are gaining ground is as van conversions and recreational vehicles. Conversions include RV's, limousines, family and luxury vans, office vans, wheelchair accessible vans and golf vans. Sprinter RV conversions can also be called Sprinter campervans. Sprinter conversions have been produced by several RV and coach manufacturers. 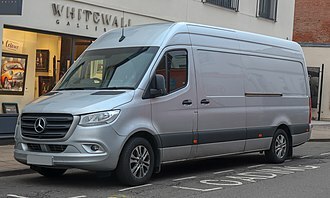 Chilled box versions of the Sprinter currently make up the majority of the supermarket Home Delivery fleet across the UK, but demand for these vans has begun to decline. ASDA recently announced that its new fleet would be primarily custom IVECO vans, following in the footsteps of Tesco. Mercedes are currently working with Waitrose Home Delivery, who currently use chilled LWB HR Sprinters, on a prototype of a new generation home-delivery van, which is currently being used in select stores, aiming to cut emissions, costs and increase time-efficiency. Sprinters have been used globally as television production vehicles, most commonly as ENG (Electronic News Gathering) and SNG (Satellite News Gathering) vehicles. These are a popular choice for local affiliates for their maneuverability in metropolitan areas and the lack of DOT regulations (in the under 10,000lbs versions). 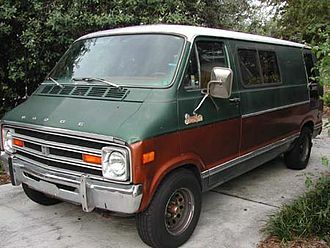 Despite not being marketed as a family vehicle, a custom-modified Dodge-branded Sprinter was used by the ten-member Gosselin family, the subjects of the TLC reality series Jon & Kate Plus 8. A Mercedes Sprinter was the vehicle used by Mike and Frank on The History Channel reality series American Pickers until Season 6, when it was replaced by a Ford Transit. The van is also used as a mobile command center by An Garda Síochána which is the national police force of the Republic of Ireland. Although primarily marketed as a goods van, the Sprinter has 4 variants designed to carry passengers. These are made by removing parts of the walls and replacing them with glass window panels. This is the smallest of the Sprinter minibuses. There are 4 sub-variants: the 23, 33, 35 and 45. It has 8-18 seats & and is 6.9-7.4 metres long. It has 4 doors: 1 on either side of the driver and front passenger seats (which, like in a van, are segregated from the main passenger compartment), a sliding door in the middle, which goes into the rear passenger seating area, and a set of double doors at the back going into the disabled area with an elevator that can be extended out of the doors when they are open. It is designed for paratransit. This minibus is a longer variant of the Sprinter Mobility where the front passenger seat has been removed and the front passenger seat door now acts as the door for all passengers. In addition, the back wall has seats along it, but can be opened as a door and the seats removed to make modifications to the interior of the vehicle. It comes in 5 sub-variants: 23, 34, 35, 45 and 55. It has 13-22 seats and is 5.9-7.7 metres long. It is designed for bus services to hamlets. This bus has a high-floor, and in addition to the driver's door, has just 1 automatic passenger door with steps. It is 7.4-7.7 metres long and has 17-19 seats. It is marketed as a mini-coach. The Mercedes-Benz Sprinter City minibus variant has been in production since 1995 and is marketed through EvoBus. The Freightliner variant has been in production since 2007. There are three sizes, Sprinter City 35, 65 and 77, which seat from 10 to 16 passengers; including standing passengers, these versions can accommodate 22 to 40 passengers. The 77 variant has a low floor throughout and a third pair of wheels at the rear. The Sprinter City has two automatic doors: a set of double doors at the front, used for passengers getting on or off and having a disabled ramp; and a single door behind the rear wheel for passengers alighting, which opens off some stairs in the high-floor area. There is also a manual door on the offside into the driver's cab. The 77 variant has double rear doors. For engine choices, the Sprinter is currently offered with inline four and V6 diesel engines; V6 petrol/gasoline; or liquefied petroleum gas (LPG) engines in Europe, Asia, Australia, and South America. In North America, only the six cylinder 3.0 L turbodiesel and 4 cylinder 2.1 L turbo diesel engines are offered. In Brazil, between 1998 and 2002, are used a Maxion/Rover HSD Diesel engine, with 2,5Lt. The versions are 310D with 95PS (Turbo Diesel) and 312D, with 115PS (Turbo Diesel Intercooler). An electric hybrid version has been tested, but is not currently officially part of the Sprinter range. 2,000 electric Sprinters are to be made by VDL Groep from 2016. The Sprinter is also available as the 316/416/516 NGT – Compressed Natural Gas (CNG). The model designations for the first generation Sprinter are W901, W902, W903, W904 and W905, depending on the gross weight rating. ^ "Algerian factory unveils new locally assembled truck for Algerian military". Db-defenceweb.co.za. Retrieved 16 March 2015. ^ "Sprinter Fertigung in China – Ralfs Mercedes-Benz Forum". Db-forum.de. Retrieved 29 August 2010. ^ "Mercedes-Benz Sprinter Classic". Wroom.ru. ^ "Is a Sprinter the Right Van for You". Cheap RV Living Blog. 1 April 2013. Retrieved 4 November 2013. ^ "Sprinter – Sprinter-Wiki". Sprinter-Source.com. 11 April 2013. Retrieved 14 November 2013. ^ "Sprinter Cargo Van Specifications". Sprinter USA. Retrieved 8 November 2013. ^ "Mercedes-Benz Argentina festejó sus 60 años con el anuncio de la nueva Sprinter". Autoblog.com.ar. Retrieved 26 February 2012. ^ "Mercedes Hit by Lawsuit Over Sprinter Model". NBC 6 South Florida. ^ chris bruce (21 April 2014). "Mercedes Sprinter vans with leaky A/C units prompt class-action suit [w/video]". Autoblog. ^ "Mercedes-Benz Vans at the 2014 International Commercial Vehicles show (IAA): Public premiere for the Vito, flanked by the Sprinter and Citan". 7 August 2014. ^ "Mercedes-Benz Sprinter: Now even safer, greener, more economical, and more attractive". 28 May 2013. ^ jeffrey n. ross (29 April 2013). "Mercedes Sprinter updated to take on Ford Transit, Ram ProMaster". Autoblog. ^ jeffrey n. ross (6 May 2013). "Mercedes-Benz releases US-spec 2014 Sprinter details". Autoblog. ^ "The new Mercedes-Benz Sprinter 4x4 - Hot on ice: The Mercedes-Benz Sprinter 4x4 - all-wheel-drive van for professional applications". 6 December 2013. ^ steven j. ewing (6 December 2013). "Mercedes-Benz Sprinter gets 4x4 variant for all-weather deliveries [w/videos]". Autoblog. ^ steven j. ewing (7 March 2014). "Mercedes-Benz bringing Sprinter 4x4 to US". Autoblog. ^ "Cargo Van Model Range". Retrieved 8 November 2013. ^ Williams, Mark. "2014 Refreshed Sprinter Van Is Ready to Take All Comers". Pickuptrucks.com. Cars.com. Retrieved 13 May 2013. ^ Sanchez, Edward. "2014 Mercedes-Benz Sprinter First Look. Major Powertrain Updates Prep Benz's Van for Stiffer Competition". Truck Trend magazine. Truck Trend. Retrieved 13 May 2013. ^ Stoklosa, Alexander. "2014 Mercedes-Benz Sprinter". Car and Driver Magazine. Retrieved 13 May 2013. ^ "More successful than ever before – the new Mercedes-Benz Sprinter celebrates its first year of production". 2 July 2014. ^ jeffrey n. ross (9 September 2013). "Mercedes, VW ending badge-engineered Sprinter deal in 2016". Autoblog. ^ brandon turkus (31 October 2013). "Mercedes offering your kids a lift with Boost program". Autoblog. ^ "Really Big Vans for Really Big Families". MotherProof.com. Retrieved 26 September 2009. ^ "La costosa camioneta del Contralor" (in Spanish). El Espectador. 26 January 2011. Retrieved 27 November 2012. ^ "The American Pickers Van". History.com. Retrieved 29 March 2010. ^ USA, Sprinter Rentals. "11 Passenger Executive Van Rental | Sprinter Rentals USA". Sprinter Van Rentals USA. ^ "Images". www.mercedes-benz.co.uk. Retrieved 20 March 2018. ^ "Sprinter City Euro VI". www.mercedes-benz.co.uk. Retrieved 20 March 2018. ^ Kanellos, Michael (5 June 2006). "The greening of the city bus". Roadshow. Retrieved 5 April 2016. ^ "UK Sprinter website". .mercedes-benz.co.uk. Retrieved 1 October 2010. ^ "Dodge Sprinter website". Dodge.com. Archived from the original on 14 July 2007. Retrieved 1 October 2010. ^ "Three Brothers Seek to Overtake Tesla With Souped-Up Plug-In Cars". Bloomberg.com. 22 September 2016. Retrieved 25 September 2016. ^ "The new Sprinter: jack-of-all-trades". Media.daimler.com. 31 March 2010. Retrieved 29 August 2010. 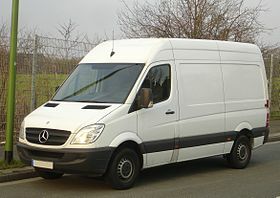 Wikimedia Commons has media related to Mercedes-Benz Sprinter. Notes: ‡ The Ramcharger was not sold in the United States after the 1994 model year; it was later made exclusive to Mexico. After Fiat S.p.A. acquired Chrysler LLC in 2009, models of trucks and cargo vans were no longer designated as Dodge, but exclusively as Ram. A timeline of these models can be found here. The straight-five engine or inline-five engine is an internal combustion engine with five cylinders aligned in one row or plane, sharing a single engine block and crankcase. This configuration is a compromise between the smaller engine and the larger straight-six. Henry Ford had an engine developed in the late 1930s to early 1940s for a compact economy car design. Lancia of Italy developed a 5-cylinder diesel engine in the late 1930s for use in their RO truck series to replace the earlier 2-cylinder diesel, the subsequent model became known as the 3RO and was used by both Italian and German armed forces during WW2. This truck remained in production until 1950, a straight-five engine did not see production for passenger cars until Mercedes-Benz introduced the OM617 diesel in 1974. The first production petrol straight-five was the 2.1 R5 introduced by Volkswagen Group in the Audi 100 towards the end of the 1970s, developments of which powered the Audi Quattro rally car. An analysis of their use shows they were used by middle-market brands seeking to extend their engine ranges into higher capacities without going for the six-cylinder option. In recent years the engine has been falling out of favour, with Volvo announcing in 2014 it would discontinue building them, the five-cylinder engines advantage over a comparable four-cylinder engine is best understood by considering power strokes and their frequency. A four-stroke cycle engine fires each cylinder once every 720 degrees — the crankshaft makes two complete rotations, assuming an even firing engine, divide 720 degrees by the number of cylinders to determine how often a power stroke occurs. For a four-cylinder engine, 720° ÷4 = 180° so there is a power stroke every 180 degrees, a V8 engine gets a power stroke every 90 degrees, 720° ÷8 = 90°, which is four power strokes for each revolution of the crankshaft. A given power stroke can last no more than 180 degrees of rotation, so the power strokes of a four-cylinder engine are sequential. At the end of one power stroke another cylinder fires. In a one-, two-, or three-cylinder engine there are times when no power stroke is occurring, in a three-cylinder engine a power stroke occurs every 240 degrees. Tehran is the capital of Iran and Tehran Province. It is ranked 29th in the world by the population of its metropolitan area, in the Classical era, part of the present-day city of Tehran was occupied by a Median city that in the Avesta occurs as Rhaga. It was destroyed by the Mongols in the early 13th century, the capital has been moved several times throughout the history, and Tehran is the 32nd national capital of Iran. The city was the seat of the Qajars and Pahlavis, the two last imperial dynasties of Iran. It is home to historical collections, such as the royal complexes of Golestan, Sadabad. Large scale demolition and rebuilding began in the 1920s, and Tehran has been a destination for the migrations from all over Iran since the 20th century. Tabiat Bridge, which was completed in 2014, is considered the third symbol of the city. There have been plans to relocate Irans capital from Tehran to another area, due mainly to air pollution, to date, no definitive plans have been approved. A2016 survey of 230 cities by consultant Mercer ranked Tehran 203rd for quality of living, according to the Global Destinations Cities Index in 2016, Tehran is among the top ten fastest growing destinations. The origin of the name Tehran is uncertain, the settlement of Tehran dates back over 7,000 years. The present-day city of Tehran was a suburb of an important Median city that was known as Rhaga in Old Persian, in the Avestas Videvdat, Rhaga is mentioned as the twelfth sacred place created by the Ohrmazd. In Old Persian inscriptions, Rhaga appears as a province and it was a major area for the Iranian tribes of Medes and Achaemenids. From Rhaga, Darius the Great sent reinforcements to his father Hystaspes, in some Middle Persian texts, Rhaga is given as the birthplace of Zoroaster, although modern historians generally place the birth of Zoroaster in Khorasan. Derived into Modern Persian as Rey, it now as a city located towards the southern end of the modern-day city of Tehran. Mount Damavand, the highest peak of Iran, which is located near Tehran, is an important location in Ferdowsis Shahname, the long Iranian epic poem that is based on the ancient epics of Iran. It appears in the epics as the birthplace of Manuchehr, the residence of Keyumars, the place where Freydun binds the dragon fiend Aži Dahāka, during the Sassanid era, in 641, Yazdgerd III issued his last appeal to the nation from Rey, before fleeing to Khorasan. Freightliner Trucks is an American truck manufacturer and a division of Daimler Trucks North America. The division is mainly for the heavy duty class 8 diesel trucks it offers. The trucks were branded Freightliners, with the first units produced in Consolidated Freightways maintenance facility in Salt Lake City around 1942, after production was interrupted during WW II, manufacturing began again, in CFs home of Portland, Oregon. In 1949, the first truck sold outside of Consolidated Freightways went to forklift manufacturer Hyster, that truck is in the Smithsonian collection in Washington, D. C. This relationship endured for the quarter century, and the co-branded White Freightliner cab-over-engine models became a familiar sight on highways across the continent. Manufacturing began in Burnaby, British Columbia, in 1961, to reduce the duty penalty on the vehicles sold in Canada. Assembly plants in Indianapolis and Chino, California complemented the main plant on Swan Island in Portland, in 1969, a new assembly plant was opened on North Basin St. which was converted to parts production. White Motor Company became troubled in the 1970s, expansion into whitegoods and agricultural equipment consumed capital without producing a return, and the relationship with Consolidated Freightways became frayed. In 1974, the agreement was terminated, and Freightliner Corp. began life as a freestanding manufacturer. 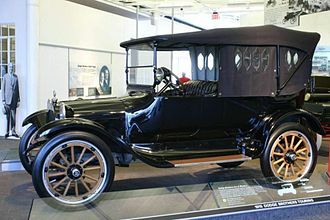 Many of the first dealers were from the White Motor Co. network, at the same time, the company introduced its first conventional model, an adaptation of the high COE mainstay product. Conventionals were popular on western roads due to more convenient ingress/egress, better ride, in 1979, a new plant in Mount Holly, North Carolina and a parts manufacturing plant in Gastonia, North Carolina, were constructed, both in the Charlotte metropolitan area. The year 1979 marked a consequential event in the evolution of Freightliner, president Carter signed bills into law deregulating transport both on the ground and in the skies. Deregulation changed the economics of trucking, and removed the protective shield of regulated carriage that protected carriers allowing much needed competition. Nizhny Novgorod, colloquially shortened to Nizhny, is a city in the administrative center of Nizhny Novgorod Oblast and Volga Federal District in Russia. From 1932 to 1990, it was known as Gorky, after the writer Maxim Gorky, the city is an important economic, scientific and cultural center in Russia and the vast Volga-Vyatka economic region, and is the main center of river tourism in Russia. In the historical part of the city there are a number of universities, museums. Nizhny Novgorod is located about 400 km east of Moscow, where the Oka empties into the Volga, the city was founded in 1221 by Prince Yuri II of Vladimir. In 1612 Kuzma Minin and Prince Dmitry Pozharsky organized an army for the liberation of Moscow from the Poles, in 1817 Nizhny Novgorod became a great trade center of the Russian Empire. In 1896 at a fair, an All-Russia Exhibition was organized, during the Soviet period, the city turned into an important industrial center. In particular, the Gorky Automobile Plant was constructed in this period, the city was given the nickname Russian Detroit. During the World War II Gorky became the biggest provider of equipment to the front. Due to this, the Luftwaffe constantly bombed the city from the air, the majority of the German bombs fell in the area of the Gorky Automobile Plant. Although almost all the sites of plant were completely destroyed. After the war, Gorky became a city and remained one until after the dissolution of the Soviet Union in 1990. At that time the city was renamed Nizhny Novgorod once again, in 1985 the metro was opened. In 2016 Vladimir Putin opened the new 70th Anniversary of Victory Plant which is part of the Almaz-Antey Air, the Kremlin – the main center of the city – contains the main government agencies of the city and the Volga Federal District. Originally the name was just Novgorod, but to distinguish it from the other and well-known Novgorod to the west and this land was named lower because it is situated downstream, especially from the point of view of other Russian cities such as Moscow and Murom. Later it was transformed into the name of the city that literally means Lower Newtown. In automotive design, an FWD, or front-engine, front-wheel-drive layout places both the internal combustion engine and driven roadwheels at the front of the vehicle. Historically, this designation was used regardless of whether the engine was behind the front axle line. Most pre-World War II front engine cars would qualify as front-mid engine, using the front-mid designation and this layout is the most traditional form, and remains a popular, practical design. The engine which takes up a deal of space is packaged in a location passengers. The main deficit is weight distribution — the heaviest component is at one end of the vehicle, car handling is not ideal, but usually predictable. Like the rear-engine, rear-wheel-drive layout and rear mid-engine, rear-wheel-drive layout layouts, it places the engine over the drive wheels, improving traction in many applications. As the steered wheels are the wheels, FWD cars are generally considered superior to RWD cars in conditions where there is low traction such as snow, mud. When hill climbing in low traction conditions RR is considered the best two-wheel-drive layout, the cornering ability of a FWD vehicle is generally better, because the engine is placed over the steered wheels. However, as the wheels have the additional demands of steering, if a vehicle accelerates quickly, less grip is available for cornering. Electronic traction control can avoid wheel-spin but largely negates the benefit of extra power and this was a reason for the adoption of the four-wheel-drive quattro system in the high performance Jensen FF and Audi Quattro road cars. 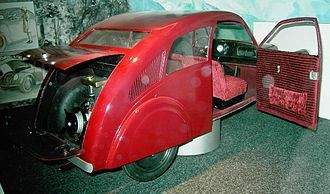 Early cars using the FWD layout include the 1929 Cord L-29,1931 DKW F1, the 1948 Citroën 2CV,1949 Saab 92, in the 1980s, the traction and packaging advantages of this layout caused many compact and mid-sized vehicle makers to adopt it in the US. Most European and Japanese manufacturers switched to front wheel drive for the majority of their cars in the 1960s and 1970s, the last to change being VW, Ford of Europe, Toyota was the last Japanese company to switch in the early 1980s. BMW, focussed on luxury vehicles, however retained the layout in even their smaller cars. The Mercedes-Benz OM601 engine is a 4 cylinder diesel automobile engine that was manufactured by Mercedes-Benz. Three variants of the engine were built, a 1,977 cc model, a 2,197 cc version built for the US market, the commercial vehicle version had 78 bhp in standard variants, the turbocharged version in the V230 TD and Vito 110D had 96 bhp. The OM601 was built with a head on an iron block. The camshafts and fuel injection pump are driven by a chain from the crankshaft. A separate single row chain drives the oil pump from the crankshaft, fuel injection is indirect via a prechamber arrangement. The OM-601s injection pump is a fuel injection unit with a 5,150 RPM mechanical governor, automatic altitude compensation. The pump is lubricated by a connection to the oil circulation. Use of the heater was recommended in climates where it drops below 10 °F for long periods. In the November 1984 issue of Car and Driver Magazine Brock Yates describes the OM601 powered 190D versus the Gasoline M-102 powered 190E2.3 around a track as, “…The Diesel is a Diesel. A van is a type of road vehicle used for transporting goods or people. Depending on the type of van it can be bigger or smaller than a truck and SUV, there is some varying in the scope of the word across the different English-speaking countries. The smallest vans, are used for transporting goods or people in tiny quantities. Mini MPVs, Compact MPVs, and MPVs are all small vans usually used for transporting people in small quantities, larger vans with passenger seats are used for institutional purposes, such as transporting students. Larger vans with only front seats are used for business purposes, to carry goods. Specially-equipped vans are used by television stations as mobile studios, Postal services and courier companies use large step vans to deliver packages. Van meaning a type of vehicle arose as a contraction of the word caravan, the early records of van as a vehicle in English are in the mid 19th century meaning a covered wagon for transporting goods. Caravan with the meaning has records since the 1670s. A caravan, meaning one wagon, had arisen as an extension or corruption of caravan meaning a convoy of multiple wagons, the word van has slightly different, but overlapping, meanings in different forms of English. While the word now applies to boxy cargo vans, other applications are found to a greater or lesser extent in the different English-speaking countries. In Australian English, the van is commonly used to describe a minivan. A full-size van used for commercial purposes is known as a van, however. Finally, the van can sometimes be used interchangeably with caravan. The British term people mover is used in Australian English to describe a passenger van. The American usage of van to mean a cargo box trailer or semi-trailer is used rarely, if ever, early Japanese vans include the Kurogane Baby, Mazda Bongo and the Toyota LiteAce van. Microvans, vans that fulfill kei car regulations, are popular for small business. The term is used to describe full-fledged station wagons and even hatchbacks with a basic trim package intended for commercial use. Compared to OHV pushrod systems with the same number of valves, the reciprocating components of the OHC system are fewer and have a lower overall mass. Though the system drives the camshafts may be more complex, most engine manufacturers accept that added complexity as a trade-off for better engine performance. The fundamental reason for the OHC valvetrain is that it offers an increase in the ability to exchange induction. Another performance advantage is gained as a result of the better optimised port configurations made possible with overhead camshaft designs, with no intrusive pushrods, the overhead camshaft cylinder head design can use straighter ports of more advantageous cross-section and length. The OHC design allows for higher speeds than comparable cam-in-block designs. The higher engine speeds thus allowed increases power output for a given torque output, in earlier OHC systems, including inter-war Morrises and Wolseleys, oil leaks in the lubrication systems were an issue. Single overhead camshaft is a design in which one camshaft is placed within the cylinder head, in the SOHC design, the camshaft operates the valves directly, traditionally via a bucket tappet, or via an intermediary rocker arm. SOHC cylinder heads are less expensive to manufacture than double overhead camshaft cylinder heads. Timing belt replacement can be easier since there are fewer camshaft drive sprockets that need to be aligned during the replacement procedure, SOHC designs offer reduced complexity compared to overhead valve designs — when used for multivalve cylinder heads, in which each cylinder has more than two valves. Exhaust and inlet manifolds were both on the side of the engine block. This did, offer excellent access to the spark plugs, in the early 1980s, Toyota and Volkswagen Group used a directly actuated, SOHC parallel valve configuration with two valves for each cylinder. The Toyota system used hydraulic tappets, the Volkswagen system used bucket tappets with shims for valve clearance adjustment. Honda used a similar system in their motorcycles, using the term Unicam for the concept. This system uses one camshaft for each bank of cylinder heads, with the cams operating directly onto the valve and indirectly, through a short rocker arm. This allows a compact, light valvetrain to operate valves in a combustion chamber. Turbo-diesel, written as turbodiesel and turbo diesel, refers to any diesel engine equipped with a turbocharger. Turbocharging is common in car and truck diesel engines to produce higher power outputs, lower emissions levels. Turbo-diesels in automobiles offer a higher refinement level than their naturally aspirated counterparts, the turbocharger was invented in the early 20th century by Alfred Büchi, a Swiss engineer and the head of diesel engine research at Gebruder Sulzer engine manufacturing company in Winterthur. Büchi specifically intended his device to be used on diesel engines and his patent of 1905 noted the efficiency improvements that a turbocharger could bring to diesel engines which in 1922 had first been developed for use in road transportation. At the time and bearing technology was not sufficiently advanced to allow a practical turbocharger to be built. The first practical turbodiesels were marine engines fitted to two German passenger liners - the Danzig and the Preussen in 1923, each having two 10-cylinder engines of 2,500 horsepower. 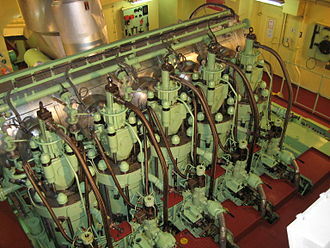 By the late 1920s, several engine builders were making large turbodiesels for marine and stationary use. Turbocharger technology was improved greatly by developments during World War II and it was now possible to use smaller turbochargers on smaller, higher-speed engines. Diesel locomotives with turbodiesels began appearing in the late 1940s and 1950s, in 1951 MAN presented a turbocharged version of their MK26 truck, although it was never put into mass production. Series production of turbocharged diesel trucks commenced in 1954, when both MAN 750TL1 and Volvo Titan Turbo were introduced to the markets, the building of the Interstate Highway System in the USA from 1956 made long-distance road transportation of goods more attractive. To keep up with traffic, more powerful engines came in increasing demand. 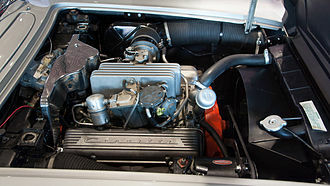 Cummins, and CAT all had turbo-charging as an option by the late-1960s, in Europe, legislation was introduced in Germany mandating a minimum power-to-weight ratio for trucks, by the late 1960s, a 38-tonne consist had to have at least 304 hp. In automotive engineering a multi-valve or multivalve engine is one where each cylinder has more than two valves. A multi-valve engine has better breathing and may be able to operate at higher revolutions per minute than a two-valve engine, a multi-valve engine design typically has three, four, or five valves per cylinder to achieve improved performance. Any four-stroke internal combustion engine needs at least two valves per cylinder, one for intake of air and fuel, and another for exhaust of combustion gases. Adding more valves increases valve area and improves the flow of intake and exhaust gases, thereby enhancing combustion, volumetric efficiency, multi-valve geometry allows the spark plug to be ideally located within the combustion chamber for optimal flame propagation. Multi-valve engines tend to have smaller valves that have lower reciprocating mass, which can wear on each cam lobe. Some engines are designed to each intake valve at a slightly different time. More valves provide additional cooling to the cylinder head, the disadvantages of multi-valve engines are an increase in manufacturing cost and a potential increase in oil consumption due to the greater number of valve stem seals. Some SOHC multi-valve engines use a single fork-shaped rocker arm to drive two valves so that fewer cam lobes will be needed in order to reduce manufacturing costs, three-valve cylinder head This has a single large exhaust valve and two smaller intake valves. A three-valve layout allows better breathing than a head. The manufacturing cost for this design can be lower than for a four-valve design, the three-valve design was common in the late 1980s and early 1990s, and from 2004 the main valve arrangement used in Ford F-Series trucks, and Ford SUVs. Four-valve cylinder head This is the most common type of multi-valve head and this design allows similar breathing as compared to a three-valve head, and as the small exhaust valves allow high RPM, this design is very suitable for high power outputs. Five-valve cylinder head Less common is the head, with two exhaust valves and three inlet valves. All five valves are similar in size and this design allows excellent breathing, and, as every valve is small, high RPM and very high power outputs are theoretically available. Dodge is an American brand of cars and sport utility vehicles manufactured by FCA US LLC, based in Auburn Hills, Michigan. 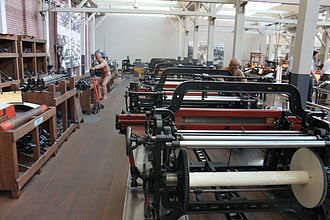 The factory was located in Hamtramck and was called the Dodge Main factory from 1910 until its closing in January 1980. The Dodge brothers both died in 1920, and the company was sold by their families to Dillon, Read & Co. in 1925 before being sold to Chrysler in 1928. Dodge vehicles mainly consisted of trucks and full-sized passenger cars through the 1970s, though it made memorable compact cars and midsize cars (such as the B-Body Coronet and Charger from 1962-79. The 1973 oil crisis and its subsequent impact on the American automobile industry led Chrysler to develop the K platform of compact to midsize cars for the 1981 model year. The K platform and its derivatives are credited with reviving Chryslers business in the 1980s, in 2011, Dodge and Dodges Viper were separated. Dodge said that the Dodge Viper would be an SRT product, in 2014, SRT was merged back into Dodge. Later that year, Chrysler Group was renamed FCA US LLC, corresponding with the merger of Fiat S. p. A.
chief among these customers were the established Olds Motor Vehicle Company and the then-new Ford Motor Company. The first machine shop where the brothers worked together as parts suppliers for Olds, the location was replaced by a larger facility at Hastings Street and Monroe Avenue, which is now a parking garage for the Greektown Casino Hotel. By 1910 the Dodge Main factory was built in Hamtramck, where it remained until 1979, by 1914, John and Horace had created the new four-cylinder Dodge Model 30. S. That same year, Henry Ford decided to stop paying stock dividends to finance the construction of his new River Rouge complex. This led the Dodges to file suit to protect their annual earnings of approximately one million dollars, leading Ford to buy out his shareholders. Also in 1916, the Dodge Brothers vehicles won acclaim for durability while in service with the U. S. Armys Pancho Villa Expedition into Mexico. One notable instance was in May when the 6th Infantry received a reported sighting of Julio Cárdenas, lt.
Fuel injection is the introduction of fuel in an internal combustion engine, most commonly automotive engines, by the means of an injector. All diesel engines use fuel injection by design, petrol engines can use gasoline direct injection, where the fuel is directly delivered into the combustion chamber, or indirect injection where the fuel is mixed with air before the intake stroke. On petrol engines, fuel injection replaced carburetors from the 1980s onward, the functional objectives for fuel injection systems can vary. All share the task of supplying fuel to the combustion process. Carburetors have the potential to atomize fuel better, Fuel injection dispenses with the need for a separate mechanical choke, which on carburetor-equipped vehicles must be adjusted as the engine warms up to normal temperature. Furthermore, on spark ignition engines, fuel injection has the advantage of being able to facilitate stratified combustion which have not been possible with carburetors, Fuel injection generally increases engine fuel efficiency. With the improved cylinder-to-cylinder fuel distribution of multi-point fuel injection, less fuel is needed for the power output. Exhaust emissions are cleaner because the precise and accurate fuel metering reduces the concentration of toxic combustion byproducts leaving the engine. The more consistent and predictable composition of the exhaust makes emissions control devices such as catalytic converters more effective, herbert Akroyd Stuart developed the first device with a design similar to modern fuel injection, using a jerk pump to meter out fuel oil at high pressure to an injector. This system was used on the engine and was adapted and improved by Bosch. Fuel injection was in commercial use in diesel engines by the mid-1920s. 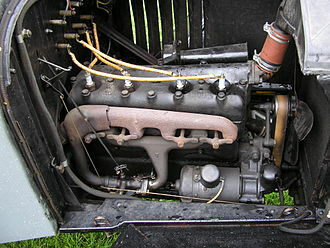 Another early use of direct injection was on the Hesselman engine invented by Swedish engineer Jonas Hesselman in 1925. Hesselman engines use the ultra lean-burn principle, fuel is injected toward the end of the compression stroke and they are often started on gasoline and switched to diesel or kerosene. 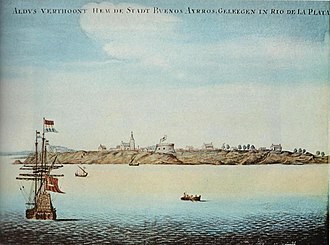 Aldus verthoont hem de stadt Buenos Ayrros geleegen in Rio de la Plata, painting by a Dutch sailor who anchored at the port around 1628. 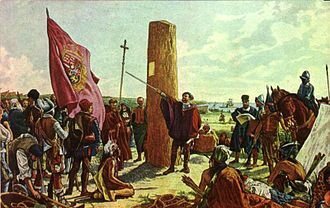 Juan de Garay founding Buenos Aires in 1580. The initial settlement, founded by Pedro de Mendoza, had been abandoned since 1542. Santiago de Liniers, 1st Count of Buenos Aires. The Casa Rosada during the Argentina Centennial, 1910. Kuzma Minin appeals to the people of Nizhny Novgorod to raise a volunteer army against the Poles (painting by Konstantin Makovsky, 1896). A Ford Transit van serving as a British police van. It has been modified mechanically and with reflective decals and red and blue rooftop lights. A 1975 Alfa Romeo Alfasud Sprint Veloce using a Longitudinally mounted front-engine and front-wheel drive. The 1970s Giugiaro styled hatchback coupe VW Scirocco based on the contemporary Giugiaro Golf was in MK1 and MK2 forms the most successful VW coupe with 800,000 made. The bonnet on this original Mini is open, showing the transversely mounted engine that drives the front wheels. Computer generated image showing the major internal moving parts of an inline-four engine with belt-driven double overhead camshafts and 4 valves per cylinder. OM601 engine with head removed. A Mazda3 with a modern common rail 1.6 liter turbodiesel engine (PSA) with variable geometry turbocharger, intercooler, 16 valves, double overhead camshafts and piezo controlled 7-stage direct injection. A Land Rover 2.5-litre 4-cylinder turbodiesel engine is typical of 'first generation' automotive turbodiesels, with mechanical indirect injection, 8 pushrod operated valves and no intercooler. The turbocharger itself is visible in the upper centre of this picture. Fuel rail connected to the injectors that are mounted just above the intake manifold on a four-cylinder engine. An Antoinette mechanically fuel-injected V8 aviation engine of 1909, mounted in a preserved Antoinette VII monoplane aircraft. The largest Daimler plant (producing Mercedes-Benz cars) is in Sindelfingen, Germany.